The United players celebrate Paul McMullan's opening goal. 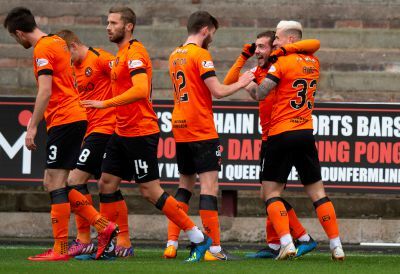 Robbie Neilson remains unbeaten as Dundee United boss after masterminding a 2-0 win over Dunfermline at East End Park. Goals from Paul McMullan and Billy King – one in either half – were enough to keep the run going and Neilson’s record since taking over from Csaba Laszlo now reads two wins and a draw. It is an excellent start for the new gaffer and his players are definitely responding well to him. The Tangerines were unchanged from the side that kicked off against Inverness the previous weekend. There was a scare for the visitors on five minutes when King lost possession in a dangerous position and Miles Hippolyte’s shot had to be pushed away by keeper Benjamin Siegrist. On 14 minutes, United’s King had a shot blocked and the ball spun up towards Fraser Fyvie, whose volley wasn’t too far away. United took the lead in controversial circumstances on 24 minutes. They were awarded a freekick which the home side thought should have been theirs, with Faissal El Baktaoui the alleged victim. Former Par Fraser Aird, who had been getting plenty of stick from the home fans, sent the setpiece over from the left and McMullan – the smallest man on the pitch – flicked a header past keeper Lee Robinson at his near post. As the United players celebrated, El Baktaoui was booked for protesting about the award of the freekick. The hosts came close to an equaliser just before the break when skipper Lee Ashcroft pulled a shot just wide of the United post. On 56 minutes, there was an odd incident when McMullan went down inside the box but actually had a freekick given against him. Robinson and United’s Aird exchanged pleasantries in the aftermath, with the Pars goalie pushing his opponent but escaping a booking. That seemed to fire the tangerines up and they made it 2-0 on 60 minutes. McMullan was involved again. He tried to find space for himself inside the box to shoot but instead squared to King, who turned back inside before firing into the net from eight yards. United brought on Nicky Clark for scorer King and the ex-Dunfermline man got a quickfire booking, while Aidan Connolly replaced James Craigen for the Pars. Pavol Safranko, who had fine game without getting on the scoresheet, nodded wide at the back post on 76 minutes as the Tangerines looked for a third goal. They should have been 3-0 up on 82 minutes when McMullan was fouled by Ryan Williamson inside the box and picked himself up to take the kick. However, his shot struck the keeper’s left-hand post and went behind for a goalkick. The Pars had the chance of a consolation in the final minute following a stramash inside the United box but Ashcroft fired the loose ball over. Also, Andy Ryan had a free run on goal in stoppage-time but his low shot was well saved by Siegrist to secure a clean sheet for United.